Hikarimuji collectively is a group of single-colored metallic koi variety that can be separated into different variants. However, one particular type that dominates this classification is “Ogon” which can be further subdivided and identified based on its coloration like yellow-gold (yamabuki), orange (orenji) or platinum (purachina). A lesser-known variety which is also part of the Hikarimuji classification is the "Matsuba" and it stands apart from the Ogon just because of the special appearance of having reticulated scale pattern. 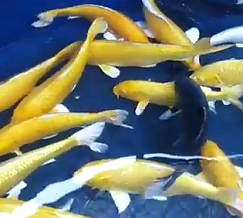 Hikarimuji are often selected and used as parent fish to cross breed and produce other quality koi such as Hikari Utsuri and Hikarimoyo (as opposed to hikarimuji, hikarimoyo is simply multi-colored metallic koi). Hikarimuji has a long history and lineage related to wild carp whereby line breeding involving only the metallic type has managed to retain the shining scaly appearance and characteristics that define this group of koi. With further experimental work done to carefully select the particular trait and feature, especially on the coloration, these were later incorporated and further enriched to produce more and more special variants that are part of the Hikarimuji class. In fact, the modern ogon that you see today sold by koi retailers (as represented by the picture above) are those types that are generally stout, has thick bulky body weight and most important, strong caudle peduncle. Other characteristic that defines whether the ogon is a quality specimen is also by examining the finnage whereby it should have the shiny metallic appearance as well. A typical low-grade Hikarimuji can command selling price of below 3-figure price tag but there are some with special desirable traits that can sell for few hundred dollars. Providing the needs and ensuring that your young fish would one day developed into a champion koi basically boils down to two important aspects; first is food and another which you would have guessed, is definitely on water quality. Both aspects have to be carefully monitored at all times and as long as you do your part to provide the best, the rest is up to your pets to develop its true potential. Most Hikarimuji that you see today are of low quality mainly because the environment that they live in is not suitable for them. For instance, in order to ensure that the fins are thick and strong, try to induce and create mild pond water circulation, something which is not too strong but just ideal to make them swim. Overcrowding should be avoiding at all cost and although genetics play a big part that determines whether they turn out to be the best, I would say the other half 50 percent is still up to you to control. Defects like loss of coloration close to the head and mouth region, unproportioned body size and shape, untidy scale arrangement are some of the most common setbacks that can devalue the quality of your Hikarimuji.